Does It Ever Get Any Easier? E-Store Customers Looking to Avoid Indie Authors? Indie Book Reviews: Objective Notice or Subjective Fanfare? Pop Quiz for a Religious Zealot? the sum of which equals a singular human performance. I find imperfect metaphors on every stage of life. and spends the rest of his life finding him. with the words and music of adolescent flesh. in the oleaginous youth sweltering fast-food heat on my behalf. to overwork and early burnout, your billboarded similes are ubiquitous. the mixed metaphors of your abbreviated life. that no likeness can enliven enduring loss. 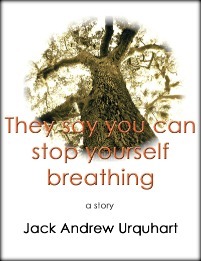 Jack Andrew Urquhart was born in the American South. Following undergraduate work at the University of Florida, Gainesville, he taught in Florida's public schools. He earned a Master of Arts degree in English, Creative Writing, from the University of Colorado at Boulder, where he was the winner of the Harcourt Brace Jovanovich Award for Fiction (1991). His work has appeared online at Clapboard House Literary Journal, Crazyhorse Literary Journal, and Standards: The International Journal of Multicultural Studies. He is the author of So They Say, a collection of self-contained, inter-connected stories and the short story, They Say You Can Stop Yourself Breathing. Formerly a writing instructor at the University of Colorado’s Writing Program, Mr. Urquhart was, until 2010, a senior analyst for the Judicial Branch of California. He resides in southern California. This entry was posted in Uncategorized and tagged Dillon T. Urquhart, Dillon Tyler Urquhart, Every Man Jack, Father's grief, grief management, Jack A. Urquhart, Jack Andrew Urquhart, memorial poem, parental grief, parental guilt, son's memorial. Bookmark the permalink.